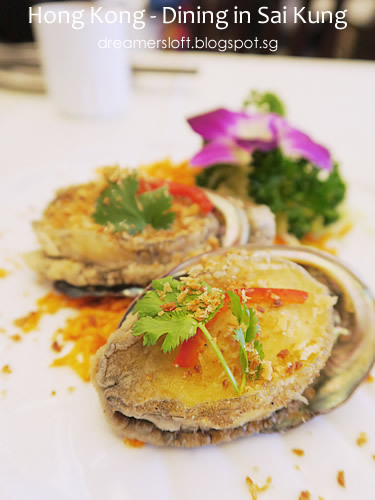 Sai Kung is famous for seafood and needless to say, we've got to try one of the seafood restaurants there. 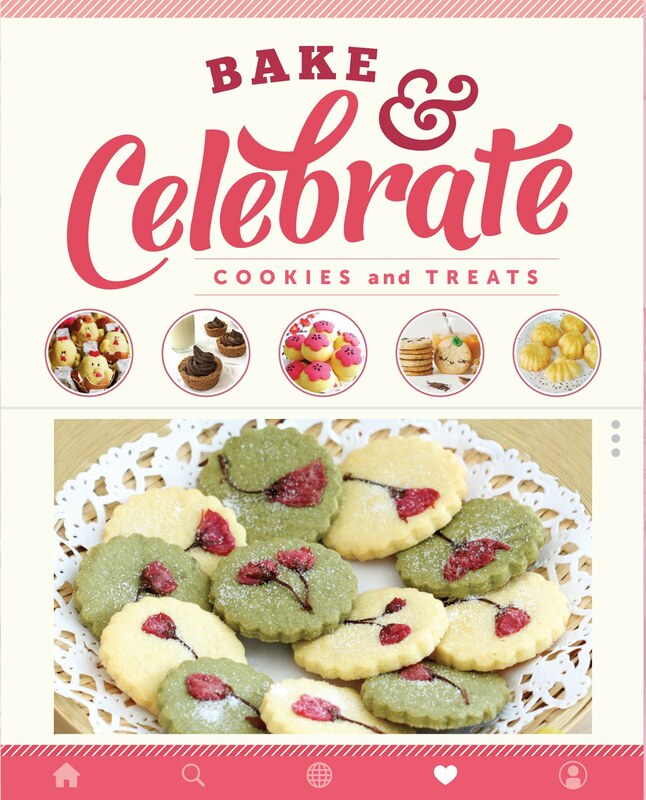 There are many renowned ones recommended by various food blogs, like Chuen Kee 全記海鮮菜館, Sing Kee 勝記海鮮酒家 and Loaf On 六福菜館. We opted for Loaf On based on recommendation from a chef (whom I attended his cooking classes before). Actually customers could purchase live seafood from the fishermen and bring the seafood to the restaurant for preparation (a cooking fee will be charged), but we were not sure about seasonal prices and didn't want to go into selection and bargaining mode, so just opted to order from the restaurant menu directly. Loaf On Restaurant is located at a street behind the main seafood street, but it's quite easy to find. Apparently it was awarded one Michelin Star before and the only seafood restaurant in Sai Kung to be awarded. We were ushered to level 3 of the restaurant. Decided to order a just a few dishes as we intended to try some other food/eateries we came across. First up, Fish Soup with Potatoes and Tomatoes. I must say this was the best fish soup I've ever tried. 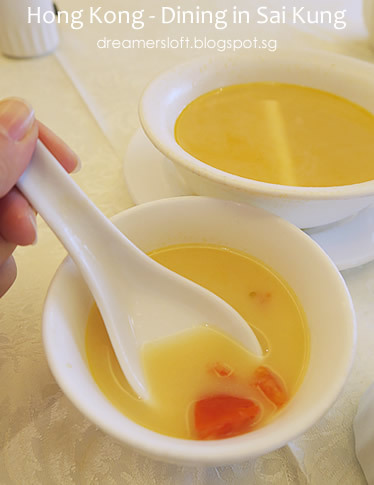 The milky broth was so sweet and refreshing without any fishy taste. Perfect for the cold weather as well. 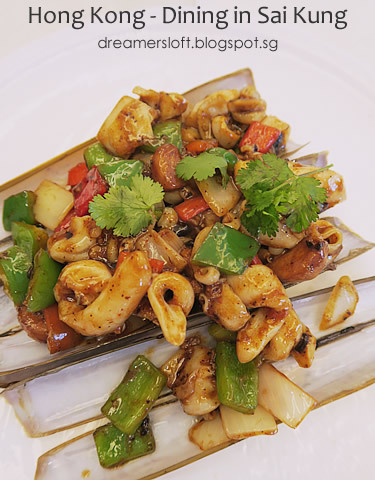 Razor Clams in black bean sauce. I was impressed by how the clams and vegetables were cooked just nicely; the clam meat was chewy and sweet and the sauce slightly spicy and very flavourful. Couldn't resist ordering a bowl of rice to go along (even though we didn't want to over-indulge in this meal). 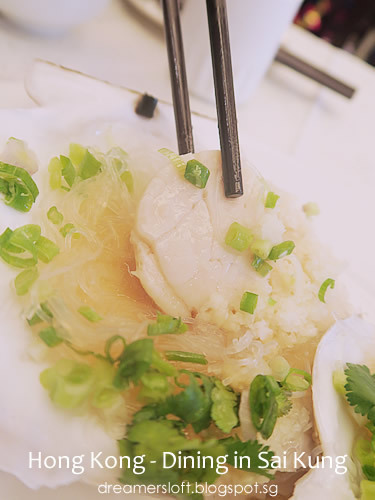 Steamed Scallops with garlic and glass vermicelli. With this dish, we could taste the freshness and sweetness of the large-size scallop. The glass vermicelli soaked up the juice of the scallop and was so yummy. Baked Salt and Pepper Abalone. I super love this abalone! Crispy outside and super tender inside! I thought it would be tasteless but the salt and pepper helped to bring out the sweetness and flavour of the abalone. 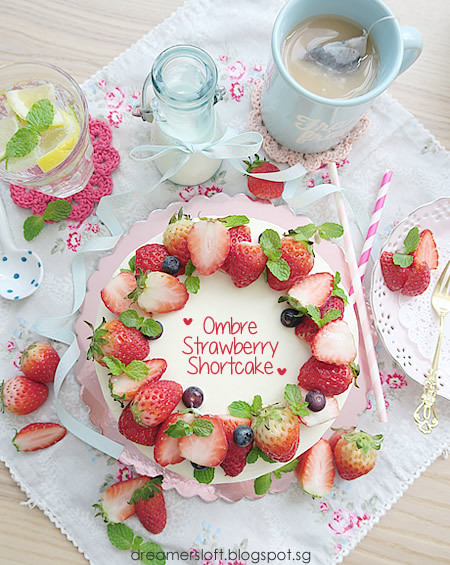 Have never tasted anything so decadent before, almost wanted to order another piece! 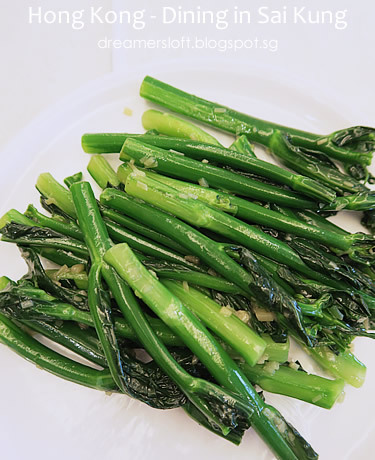 Stir-fried Kailan in garlic. This vegetable dish was a little disappointing though. Mainly the stems were served (I guessed this is the usual method of serving Kailan in HK?) which we felt a little too much. And some of the stems were a bit on the tough side. Overall, an enjoyable and decadent seafood lunch. Service was good, but a little bit on the slow side. Since we were there to relax, didn't mind it given the nice ambience. 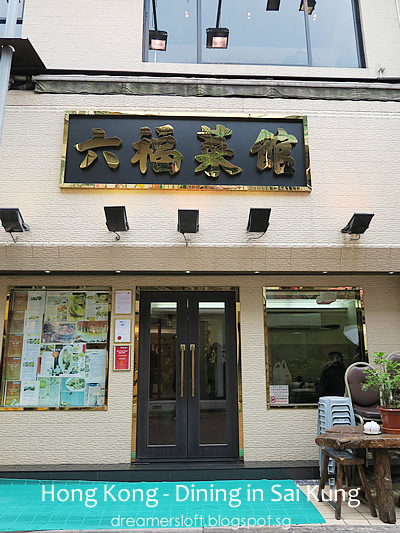 Probably if there's a chance to return to Sai Kung again, we would try the other seafood restaurants like Chuen Kee (for the experience of ordering seafood from the fish tank displays). 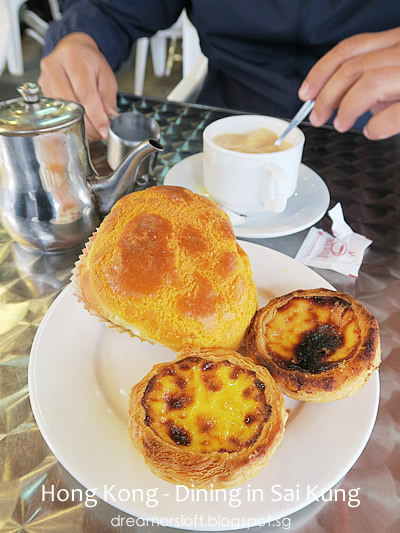 There's a small area for dine-in, so we ordered a milk tea to share, and two types of egg tarts, fresh milk egg tart and Portuguese egg tart, and a traditional bo luo bun. 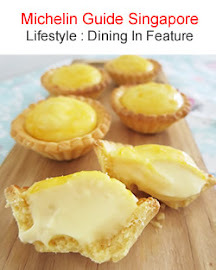 The fresh milk egg tart was freshly out of the oven and smelled heavenly, tasted heavenly too! The pastry was flaky and crispy and the fresh milk custard so creamy and smooth, as good as the one I had at Honolulu Cafe! 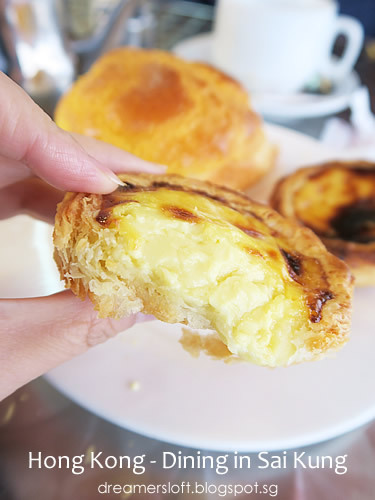 The Portuguese egg tart was good but normal, a tad to sweet. The bo luo bun was soft and fluffy with a crispy crust, a pity that it's a bit cold already. If it's warmed up or fresh from oven, I reckoned it would be perfect. Luckily we dined earlier, because when we passed by the bakery in the late afternoon, there was a long queue and the dine-in area was full. 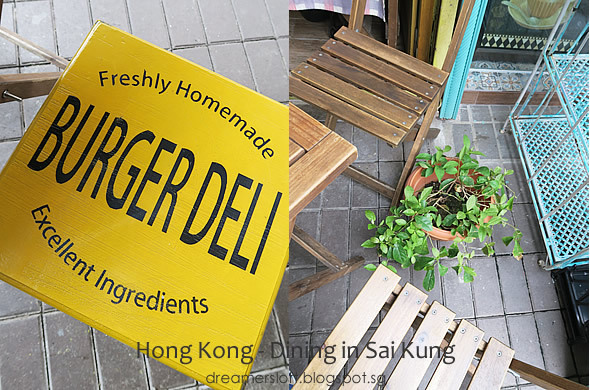 Anyways, after we had the egg tarts, we spotted this Burger Deli selling burgers. 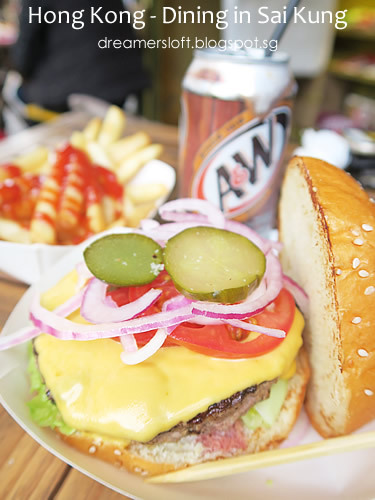 After a week of chinese food, suddenly some greasy burgers and fries sounded so good! But we were too full by then, so decided to walk and shop around before returning later to try the burger. And so we returned in the late afternoon and shared a Classic Beef Burger and Skinny Fries. 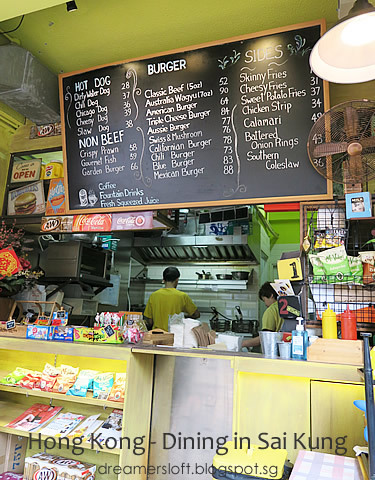 Besides burgers, there are other items like hot dogs, chicken, fish and side dishes. The beef burger looked good indeed, came with medium done beef patty, lettuce, melted cheese, tomato, onion and pickle. 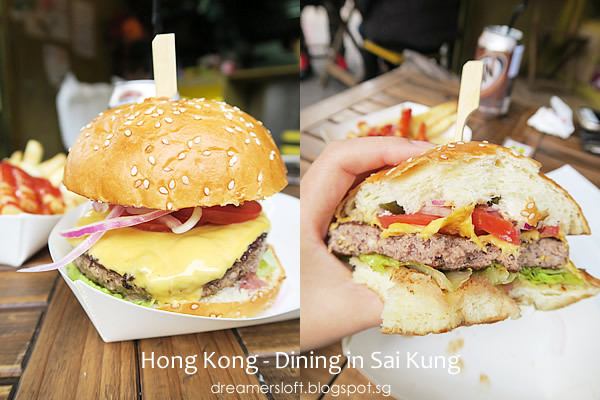 The burger bun was fluffy and soft, beef patty was succulent and juicy and the generous slice of melted cheese simply enhanced the overall taste of the burger. And even though the fries was supposedly skinny, they weren't at all, they were quite thick and fat, crispy on the outside yet moist and fluffy inside. Thumbs up. 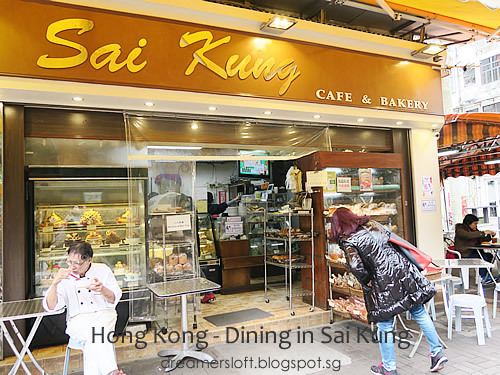 We only managed to try a few eateries/food in Sai Kung, but there are actually many other choices available. 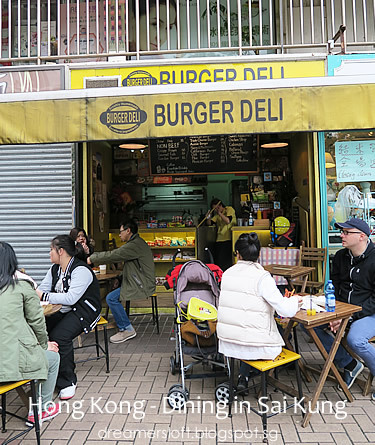 Besides seafood, there are the Cha Chaan Teng, trendy cafes, retro cafes selling traditional HK snacks (there's a popular shop super crowded and long queue so we didn't try), hole-in-a-wall shop selling Fish & Chips (long queue, we didn't try) etc. Besides dining, there are also some interesting shops selling knick knacks, household items, sports wear, ornaments etc. Sai Kung is definitely worth at least half a day visit, and given the chance, we would love to return next time! Next post, I'll be covering PMQ Creative Hub in Central HK. Stay tuned!